New Delhi: The Defence Ministry had protested against parallel parleys by the Prime Minister’s Office (PMO) with the French side the Rafale deal, says a report by The Hindu, triggering strong reactions from political parties and experts and bringing Parliament proceedings to a halt on Friday. According to The Hindu's Friday report on the Rafale fighter jet deal, at the height of the negotiations over the controversial Rafale deal between India and France, the Defence Ministry raised strong objections to “parallel negotiations” conducted by PMO. The then Defence Secretary, G. Mohan Kumar, made this official notation in his own hand: “RM may pl. see. It is desirable that such discussions be avoided by the PMO as it undermines our negotiating position seriously”, says the noting, a facsimile of which has been published by the newspaper. His firm opposition was recorded on November 24, 2015 on a note prepared by S. K. Sharma, Deputy Secretary (Air-II), and endorsed by the Joint Secretary & Acquisition Manager (Air) and the Director General (Acquisition) in the Ministry. General Reb’s letter was brought to the notice of the PMO by the Defence Ministry and the head of the Indian Negotiating Team, Air Marshal S. B. P. Sinha, AVSM VM, Deputy Chief of Air Staff, had also written to Mr. Ashraf. It further stated that this was not the only instance of “parallel negotiations” in which the Indian side took contrary positions. 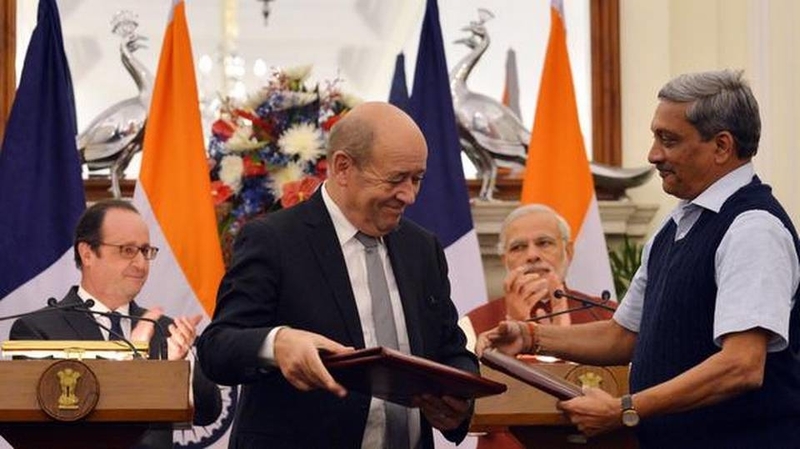 It has already been reported that the National Security Adviser, Ajit Doval, negotiated with the French side in Paris in January 2016 and as reported by The Hindu, it has access to documentation that confirms this. Doval’s advice to Parrikar on doing away with a sovereign guarantee or bank guarantee for the Rafale deal was also recorded by the then Defence Minister in a file noting, according to an article written for The Wire by Sudhansu Mohanty, who has worked as Controller General of Defence Accounts and then as Financial Adviser, Defence Services, Doval had no locus to negotiate the Rafale deal. The proceedings in Rajya Sabha today were washed out as Opposition members insisted on a discussion on The Hindu's revelation on the Rafale deal after which the House was adjourned till Monday. Earlier in the day, Congress president Rahul Gandhi held a press conference in which he stated that the expose clearly proved that the PM was involved directly in carrying out parallel negotiations. CPI(M) General Secretary, Sitaram Yechury in a series of tweets said, “Modi has consistently undermined the Air Force & Defence Ministry in the Rafale deal for corruption, to benefit his cronies. His actions have hurt the public exchequer & damaged national security. These facts have been hidden from Supreme Court where a review petition is pending” and “The PM must take responsibility for the loss to the exchequer, violation of procedure to get far fewer fighter jets than what Air Force wanted. All just to help cronies,” he said. Yechury alleged that the “wires in this scam go straight to the top man”. “For whose benefit was Modi undermining defence ministry & Air Force? Why was IAF’s Deputy Chief forced to write to Modi’s PMO to stop ‘parallel negotiations’ with France?” he asked. Defence Minister, Nirmala Sitharaman”s suo motu statement came in the Lok Sabha in the wake of protests by the Congress and other Opposition members over The Hindu’s report. She said, “they are flogging a dead horse. Periodical enquiries by the PMO cannot be construed as interference.” She charged the Opposition with playing into the hands of multinational companies and vested interests and not working in the interests of the Indian Air Force. Is Imran Khan Gaming Modi and Doval in Indian Elections? Doublespeak is commonplace in statecraft. A celebrated case is of the former who was facing re-election in 2012.